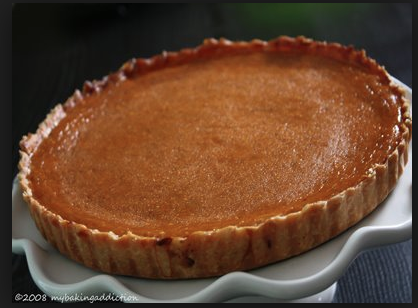 hightouchmegastore: To bake a pumpkin pie. First, you must have purchased a pie pumpkin. These are generally round and compact and not of jack-o'-lantern proportions, rather smallish, modest, without aspirations for Cinderella transport or anything of the sort. Next, you must assess your time and space availability. Because you will need to make a crust. You will need to roast the pumpkin. You should allow for the possible difficulties, crust-wise, and you must assess your butter stores. This is important. Without enough butter, your pie crust will be tricky, and you will not be happy. You must develop a Plan A and a Plan B and possibly a Plan C. Plan A is the one where you make the pie dough the night before, so that it can "rest" and be at peace with itself. Plan A is the one where you come home from the movie on Friday night, get out your butter--ample and sufficient--and cut it into tiny cubes and rub it with your fingers into the flour, &c. &c. until the dough "gathers" into a "ball," and you press it into a flat round and put it in the refrigerator. Plan B is where you decide you can do all of that the next day, the day the pie is to be taken to a party. And why not? In Plan B, you remind yourself of all the pies you've recently made, very successfully, you remind yourself, and also why be so ahead of yourself, when you're tired, heaven knows you are? And you still have to walk the dog? Fourthly, at 4 p.m. the day of the party, you must reckon with the fact that you may have left yourself only barely enough time to make this damn pie. Fifthly, you must reckon with the fact that you have only barely enough butter. Maybe not even quite that much. Sixthly, you will forge ahead and make a pie dough that perhaps exhibits the symptoms of the not-quite-enough-butter factor, and thus the mark of a smallish bit of over handling. Alas. HOWEVER: The fact that you have engaged with pie dough with great success and quite recently to boot will mean that the pie dough does not quite get the best of you. Almost but not quite. It will be crack-y and difficult, it will not quite cohere, it will show the seams. It will, in fact, deconstruct itself. THEN your pie will have arrived and fulfilled its destiny, and you will have nothing to apologize for. You will take it to the party and serve it up in tiny slices, and you will be glad yet again not just for this pie, or the arrival of pumpkin season, but for the category of pie itself. Sounds almost worth going to a party for. Seriously, you make me want to eat nothing but pie all the days of my life. And would that be so wrong? I wish I wanted to do this. Maybe I'll just settle for eating pie that you make. Sounds sooooo good. No radagast, that would not be wrong at all! HT, I bow in admiration to your baking skills and to this loveliest of odes to a pumpkin pie!